Email autoresponders are an excellent marketing tool that very few businesses can afford to be without these days. It is a program that responds automatically to requests for information from visitors to your site or subscribers to your newsletter. For instance, you can place a web form on your website inviting visitors to subscribe to your email newsletter. Whenever someone enters their name and email address into the webs form, the autoresponder will reply automatically to let the person know they are subscribed to your list. As you continue to grow your email list, your autoresponder becomes even more useful since it will allow you to send out a personalized email newsletter to thousands of subscribers all at the same time, without needing to do this manually. Statistics show that fewer than 50% of consumers respond to a sales offer the very first time that they see it. Most sales are not made until people have had 5 to 7 reminders. 1. Your credit cards are already maxed out. 4. Or you need to ask your friends or family members first to make sure. The same thing is true of your online customers. With your autoresponder you can send out repeated messages automatically to thousands of prospective customers that explain all of your product’s benefits. 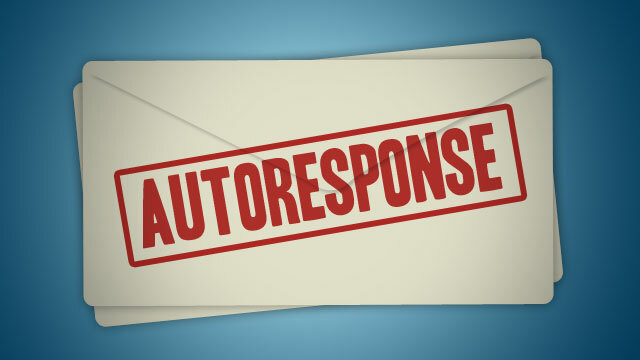 Your autoresponder might reside on your service providers’ server or your web host. Whether your host provides the autoresponder or you upload it, it should use one email address. For instance, mynewsletter@yourdomain.com or it could be the name of your product. Save the information from your customer or visitor in a text only file and provide the corresponding email address to the autoresponder that you have reserved for this type of information. Then upload the new autoresponder document onto your host server. How this is done will depend on your hosting service. Why do you need an autoresponder? As soon as you have your website up and running, you should start to grow your email list. If you are planning on sending out tutorials via email or teaching promotional topics or marketing to other people online, then you need to make sure that you get your autoresponder set up as soon as possible after your website is up and running. Ability to email documents in both HTML and text formats. Ability to provide an initial response (i.e. welcome message) in addition to numerous follow up messages. Ability to spread out follow-up messages over an extended period of time. Ability to personalize the subject line and body of the message. Good autoresponder software is available that can perform all of those tasks and more. An autoresponder is a very important tool that every serious online marketer needs to take advantage of. You might start out manually emailing your subscribers. However, as your list continues to grow, you will find that lots of your time is being taken by work that can be automated.